Celebrate #Yoga Day on June 21 with a Seva! Yes, #YogaDay! To be more specific, June 21, 2015 (Sunday) will mark the first International Day of Yoga. The United Nations General Assembly declared this last December 11, 2014 three months after the call of India’s Prime Minister Narenda Modi to dedicate one day to celebrate this ancient practice. On this special #YogaDay, yoga+ will open its doors to the public at Tordesillas, Makati for a “Sama-Sama Seva for Nepal” event. A full-day of yoga classes, meditation and talks from 6:30am to 8:00 pm. The classes lined up are: Rocket Yoga (Bri Manglapus), Hot A (Roxanne Piad), Kundalini Yoga (Rosan Cruz), Therapeutic Yoga (Irene Lavina), Tension Release Exercises (Elrik Jundis), Yin Yoga (Ria Tirazona), Capoeira (Cookie Pido), Breathing exercise for Stress and Insomnia (Liana Romulo), Five Yamas and Daily Food Choices (Nancy Siy), Mindful Meditation (Neil Salang), Emotional Intelligence through Mindfulness (Dinah Salonga), Embodying Asana (Donna Tumacder-Esteban) and will end with a Satsang, Drum Jam (Art of Living and David Esteban). The all-day pass for the event is P500. 50% of the proceeds will go to the earthquake relief effort in Nepal, specifically, to the Laksmi Orphanage and Budhanilkantha Model Community Academy. 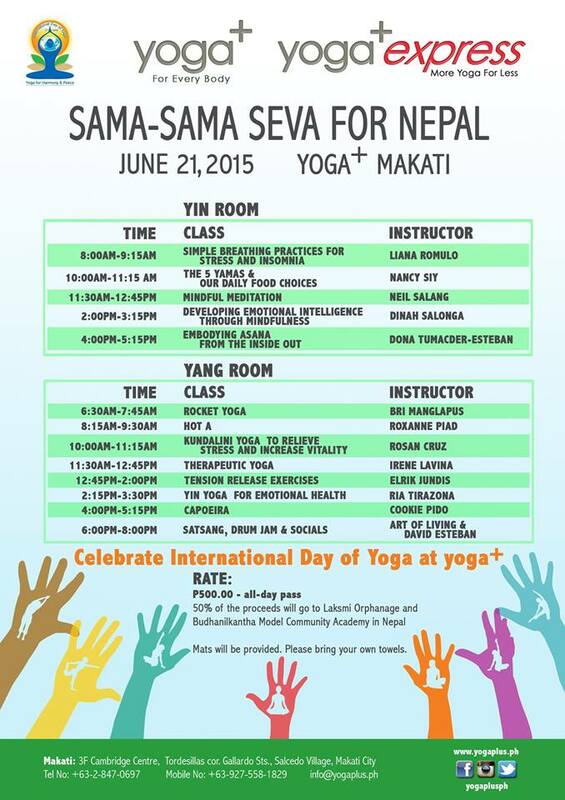 To purchase the all-day pass, contact yoga+ Makati at 847-0697.